KONG HEE Sentence: Eight years' jail. CHEW ENG HAN Sentence: Six years' jail. TAN YE PENG Sentence: 5-1/2 years' jail. SERINA WEE Sentence: Five years' jail. JOHN LAM Sentence: Three years' jail. SHARON TAN Sentence: 21 months' jail. They have filed their papers. Today, the six City Harvest Church (CHC) leaders at the centre of a multimillion-dollar financial scandal will return to face the courts. The marathon City Harvest trial begins again in the High Court, with both the defence and prosecution appealing. The appeal will continue tomorrow and for the first three days of next week. It will be heard by Judge of Appeal Chao Hick Tin, and Justices Woo Bih Li and Chan Seng Onn. 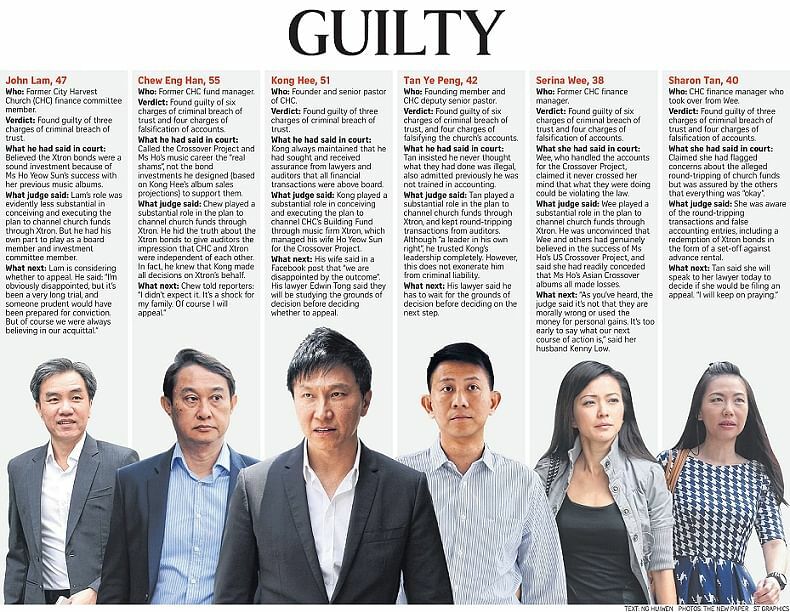 The six who have been convicted - including CHC founder Kong Hee, 52 - are arguing against their convictions and sentences, while the prosecution is appealing for longer deterrent sentences. In October last year, the six were convicted of misappropriating millions in church funds to fuel the pop music career of Kong's wife, Ms Ho Yeow Sun, in a church mission known as the Crossover Project. The court found that they had invested $24 million from CHC's building fund in bogus bonds from music production company Xtron and glass-maker Firna, but this money was, in fact, used to fund the Crossover Project. Later, another $26 million was used to cover up the initial misdeed. For their crimes, the six were handed jail terms ranging from 21 months to eight years. Kong, fingered as the key man behind the scandal, was given the stiffest sentence. Presiding Judge See Kee Oon had choice words for the charismatic church pastor, whom he said "acted consciously and dishonestly". "One does not need to be an expert in legality to appreciate certain fundamental aspects of honesty, truth and integrity," said Judge See in his written judgment. Former CHC fund manager Chew Eng Han, 57, was handed a six-year term. And as Kong's right-hand man, deputy senior pastor Tan Ye Peng, 43, was given a sentence of 51/2 years. Former church finance manager Serina Wee, 39, was given a five-year term. Former CHC finance committee member John Lam, 48, was sentenced to three years in jail. Former church finance manager Sharon Tan, 40, received a sentence of 21 months' jail - the shortest. Calling the case unique and without precedent, Judge See had agreed with the defence that the church suffered no wrongful loss, but still found them guilty of serious offences - including falsifying church accounts and breaches of trust involving large sums of charity money. But the prosecution has described the jail terms as "manifestly inadequate". During the trial, it called for harsher sentences - highlighting the fact that the case involved the largest amount of charity funds ever misappropriated in Singapore's legal history, which has shaken public confidence in the charity sector. Said Deputy Public Prosecutor Christopher Ong: "It must be made clear that those leading charities, entrusted with the funds, must adhere to the highest standards of integrity and transparency." The session starting today could be the final avenue of appeal open to the six church leaders. If their appeals fail, they can refer the case up to the Court of Appeal, with its permission - and only if there is a point or question of law to argue.